How can we support sales so they can focus on what they do best? Organizations, both small and large, are asking this question year after year. This is the very core of sales enablement, and the dominant reason for the rise in countless technologies. No matter the size of an organization, sales complexities exist. Sure, small teams are operating on different budgets than enterprise, but the goals they are trying to achieve are just as critical. And everyone is trying to figure out a way to align efforts, because there is evidence that the strongest teams are working together to meet company objectives. Industry expert Matt Heinz recently conducted the 2017 State of Sales Enablement study with Highspot. This in-depth report features results from a mixture of nearly 600 sales and marketing professionals to paint a data-driven picture of the sales enablement landscape. Here are a few interesting insights worth considering as you guide your company’s sales enablement initiatives, and of course, to know where you stand in a very complex sales world. 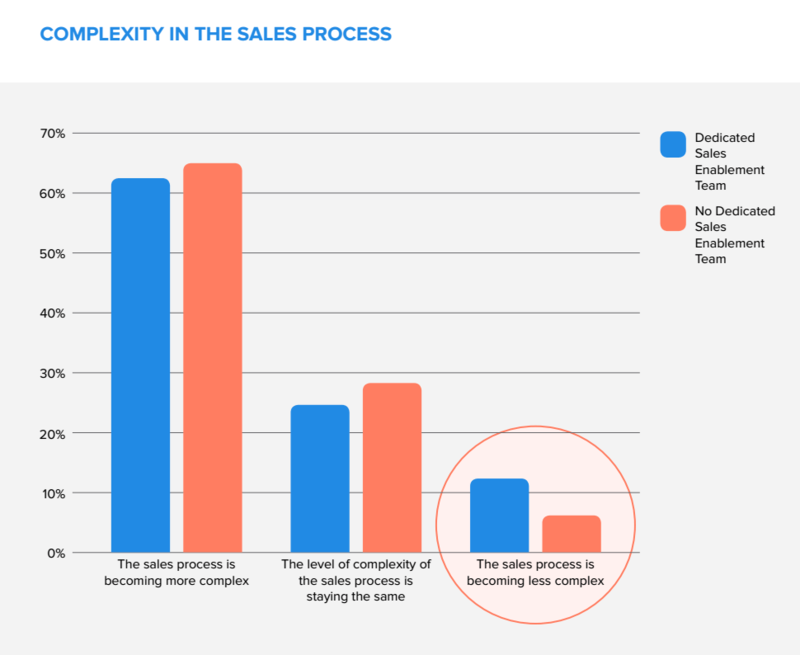 When it comes to the level of complexity organizations are facing today, 65% of organizations agree the sales process is becoming even more complex. The data below shows the different perspectives between organizations with a dedicated sales team versus those without one. 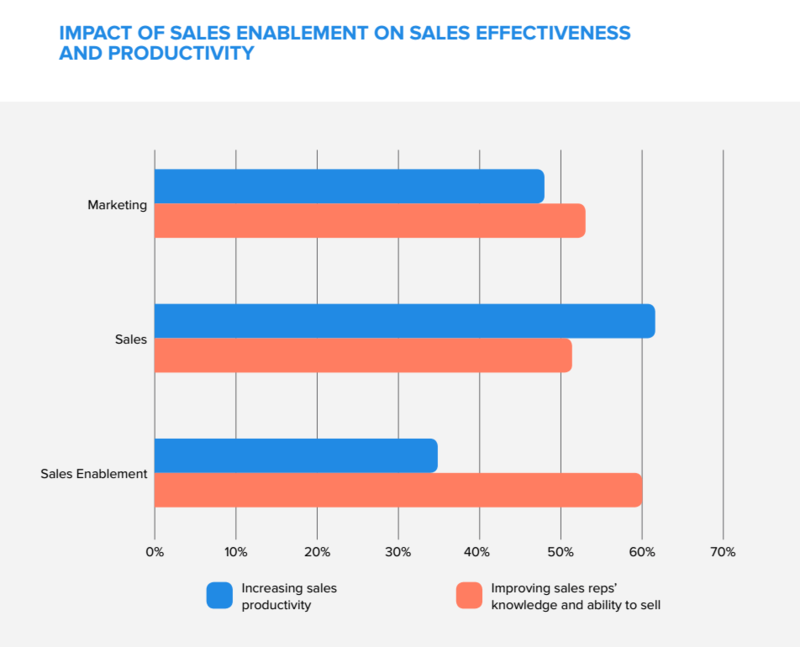 Companies using sales enablement technology are able to actually lessen the complex activities they face every day. An overwhelming majority of the respondents (87%) agreed that one of the main obstacles is the increasing number of internal stakeholders. 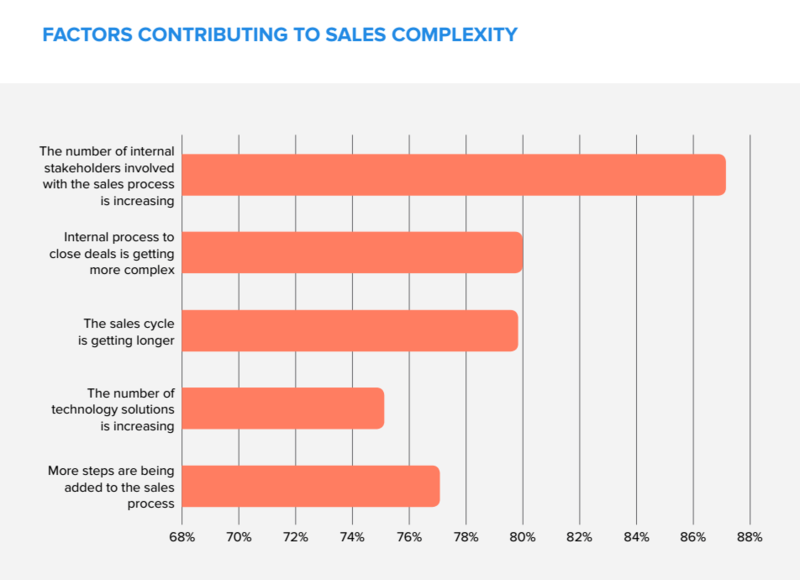 Also a factor, tied at second and third for around 80% of respondents, were a lengthier sales cycle and the increasing complexity of internal processes to close deals. With RFP response, organizations are working hard to overcome the challenges of a manual process. This typically involves hunting for answers through spreadsheets and email when a deadline requires a quick turnaround, with a project lead trying to collaborate with multiple SMEs (Subject Matter Experts) who are difficult to track down for input. This outdated approach greatly impacts a company’s ability to close deals and ultimately affects the bottom line. RFP software is still a newer player in the sales enablement technology space, but an important one that is helping teams address their internal processes so they can win more business. 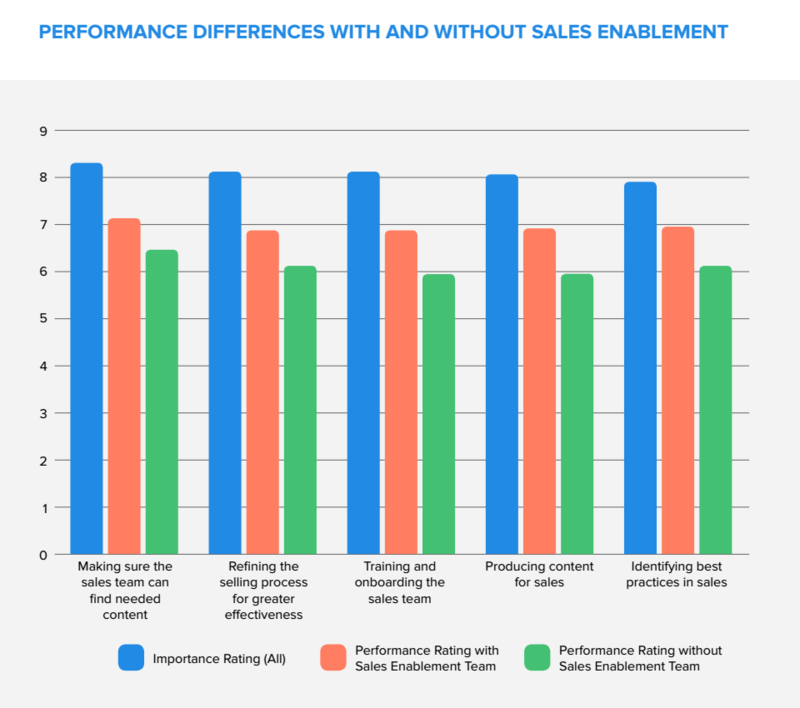 Businesses with a dedicated sales enablement team rated higher across the board for every key driver of sales success. Making sure teams can find the necessary content to support the sales cycle is a huge opportunity for companies. If the content is located in multiple places and only accessible to a few team members, then there are unnecessary hoops to jump through. And when time is of the essence to close a deal, spending time on the information hunt can potentially disrupt a deal. RFP responses are no different. They are an opportunity to win new business that can frazzle teams racing against deadlines—not to mention competing against other vendors who might win the business instead. Having a centralized answer library is a great way to alleviate this disorganization for teams. Beyond RFPs, having this company information collected in one place—polished and ready to go—means that a repository can serve as a hub for sales content as well. Many of the same questions in the sales cycle are asked for RFPs. An answer library can benefit busy teams who are experiencing an internal disconnect, especially when communication is challenging cross-departmentally. 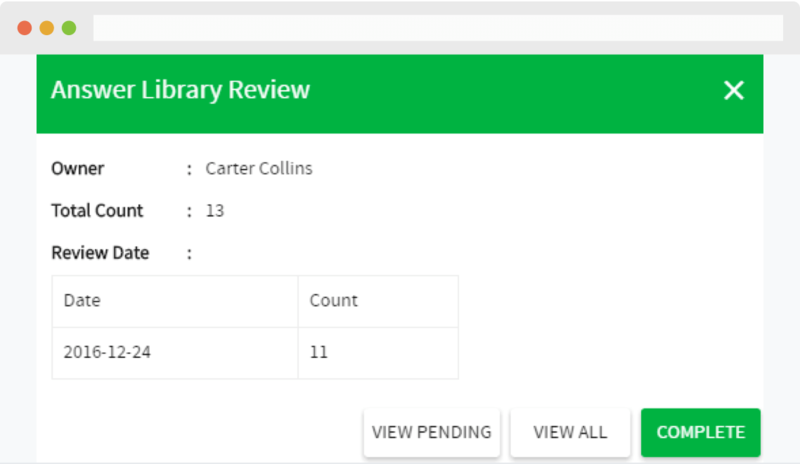 Teams using a solution to manage their RFP responses also have the added workflow benefit of being able to assign content owners within the answer library, along with automatic reminders for content review. 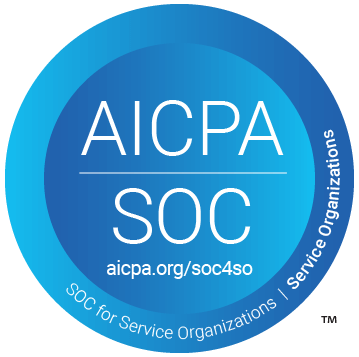 This overcomes the risk of content going stale or being outdated, especially in organizations where information changes constantly, which is a common struggle with tech companies. The results from the sales enablement study align with our own that we have seen firsthand, with teams cutting their RFP response time in half after automating their RFP process with technology. Productivity is impacted positively by a joint effort by a company to enable their sales team. And increasing sales productivity goes hand-in-hand with wasting less time. For example, when responding to RFPs, sales teams are spending too much time fiddling with document formatting: copying and pasting, aligning bullet points, making the font consistent. Solutions that automate the import and export of documents can greatly reduce that time. Though something as commonplace as document formatting may seem like part of the job, administrative tasks like this take sales away from their primary job responsibility…selling. Fewer manual tasks is always better for everyone. 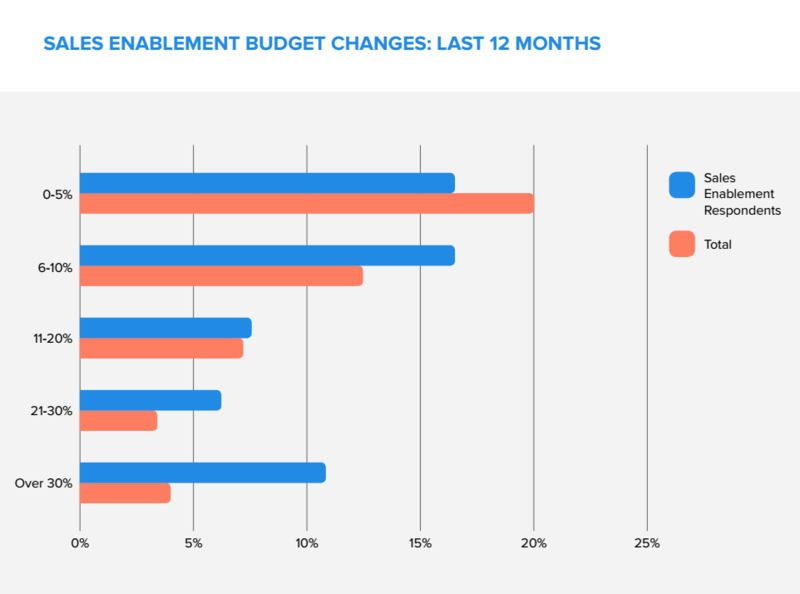 The good news for teams is that sales enablement budgets continue to rise, with 47% of the survey respondents sharing that they saw increased budgets in 2016. Technology options continue to expand, as do sales stacks. But the right mix of tools, with a focus on sales enablement, is proving the case for additional technology to smooth out the noticeable complexities a majority of organizations are experiencing. 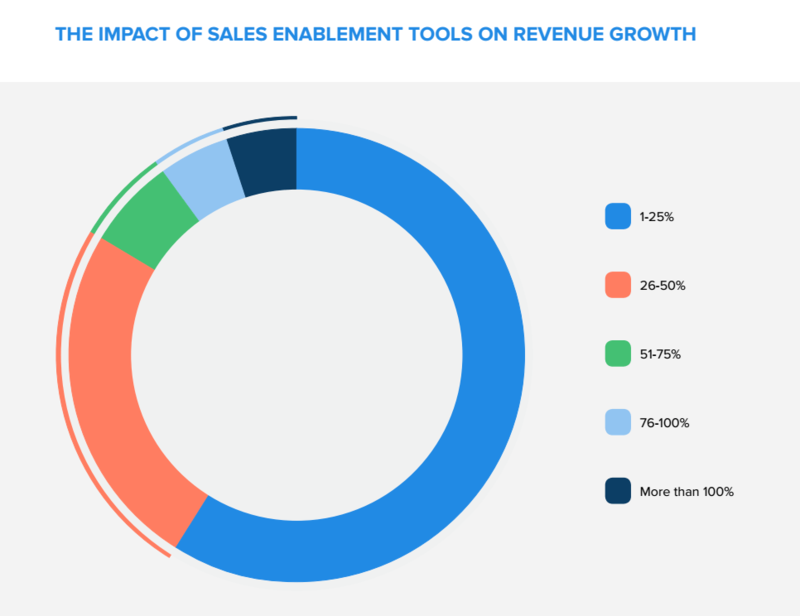 In the end, revenue growth benefits outweigh the initial cost of the investment in sales enablement tools. Over 75% of the respondents who adopted these tools at their organization reported an increase in sales over the past year. As long as sales enablement technologies are easy to use, teams can adopt quickly and see an immediate impact on their overall effectiveness. Productive teams are happier and they drive better results because of that. It’s exciting to see how sales enablement is becoming more widely adopted, and how data is showing the positives of the investment. As with any technology, it’s important for teams to work together to find the right solutions for their business. With the increase in sales complexity, it’s safe to say that sales enablement is a solid idea.